Chronicle Books, San Francisco, 2008. 150 pages. Here's a magnificent book for any adult who loves children's picture books. I don't think of myself as knowing much about art, but this book taught me much, and helped me appreciate the work and talent that goes into making picture books today and the great tradition behind it. This wonderful book is in large format with lots of examples. It explains the career, the inspiration, and the techniques of twelve great children's book illustrators. 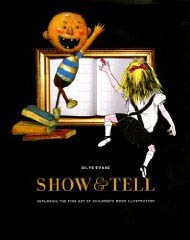 The illustrators that Dilys Evans chose to feature are: Hilary Knight, Trina Schart Hyman, Bryan Collier, Paul O. Zelinsky, David Wiesner, Betsy Lewin, Harry Bliss, David Shannon, Petra Mathers, Brian Selznick, Denise Fleming, and Lane Smith. The definition of "art" has been debated for centuries, but to my mind art happens when a particular creation stops us in our tracks. It makes us think. It touches our deepest emotions and oftentimes it teaches us something new. For my purposes I needed a wide range of styles, techniques, and content. Some of the illustrators I have chosen are icons in the children's book world, others are relative newcomers. But this is not a "best of" list. That would be impossible, given the incredible number of talented artists working in children's books today.... My purpose was not to profile a particular group of illustrators but to choose a group that would offer readers as broad a frame of reference as possible. Ultimately, my hope is that this book might help all of us who value children's books to find a universal language to talk about art on the page; a vocabulary that helps describe this unique form of artistic expression with greater clarity and common understanding. And that we will then take that vocabulary and use it to explore the many other wonderful books that are on our shelves. In this regard, we truly suffer from an embarrassment of riches. Children's books have never looked better or been more important. They are one of the few quiet places left where a child can go to be alone, and to travel worlds past, present, and future. They are often the first place children discover poetry and art, honor and loyalty, right and wrong, sadness and hope. And it is there between the pages that children discover the power of their own imaginations. They are indeed a dress rehearsal for life. Here's a wonderful look behind the curtain at how that stage scenery is created.